It's been a busy end of the year for me and I'm sure I'm not the only one anticipating a little break. It'll be a short one for me, however, but even a few days off are more than welcome. I am hoping to spend some time just sitting outside, on the balcony, with a cool drink in hand, reading a good book. The drink of choice for me would have to be this cool rhubarb glögg - a spiced drink made to remind me of Christmas, but adapted to season's demands. 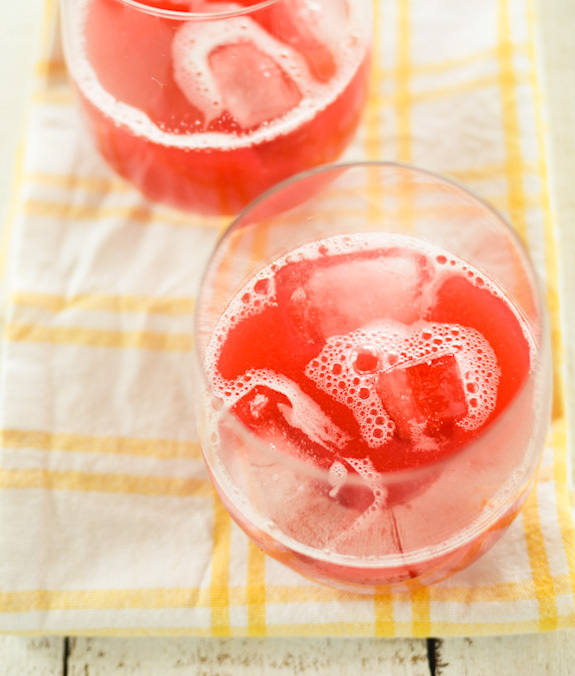 I adore rhubarb, I'm sure you've realised that by now, and this drink is for all you die-hard rhubarb lovers out there. It's completely sugar-free, so prepare yourself for some real rhubarb flavour pared with warming spices and a drizzle of lemon juice to freshen it all up. I am more than happy to pour myself a glass of this with lots of ice, lift my feet up and bury my head in a book. 1. Place the rhubarb, spices and ginger in a saucepan and add about 1 litre of water. Bring the mixture to boil, then leave to simmer for about 15 minutes. 2. Drain the juice into a bowl and leave to cool. 3. Drizzle with lemon and serve cool with ice. Yum! 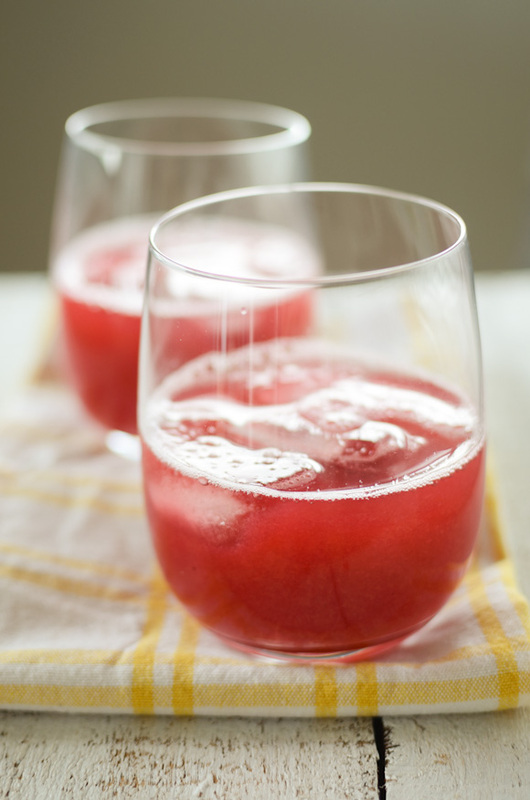 I have recently become a rhubarb convert and will definitely have to try this recipe. Do you find that without the sugar it is quite tart though? Interesting and surely really divine! Cool recipe! Can you still by fresh rhubarb in groceries? Here in Belgium you can't find them in december. This would be perfect for summer, if summer ever decides to get here! Sounds delicious. What a beautiful, festive color, and such a refreshing drink for the summer holiday season. I don't have much experience with rhubarb, but this looks like a great place to start. I was just telling my boyfriend that I wouldn't gain nearly as much weight during the holidays if we lived in the Southern Hemisphere. Your posts the last few days have proved my point, and now a drink with ice in it? That's just going over the edge. Happy Holidays! A very pretty red, and I've always liked the taste of rhubarb... win! Looks delicious and perfect for Christmas. I can imagine that this is pretty sour tasting, but I bet it's delicious, and refreshing. I wish we had some rhubarb this time of year, I'm curious to try it(although I might add some honey - sorry! :D) It certainly looks beautiful - I love the color! Brilliant twist on the traditional! I love the sound of it! Such a pretty and festive drink for the holidays! I love your Finnish with a twist- holding on to tradition but adapting it to where you are now. This sounds so refreshing Maria, but is it wrong of me to be thinking it would be nice with a little vodka as well? I never thought of using rhubarb in a drink, thanks for the idea! How unusual! And what a beautiful colour! Of course I would probably sin and add another ingredient ;) ! I love rhubarb, yes I imagine it makes a lovely drink as you have demonstrated! Ohh, this looks so good! And I love that it's adapted to warmer weather, as we are having a very warm winter in Florida. I've never had glogg before, will be correcting that soon :) Thanks for sharing. Oh, that looks so refreshing. Wow, that sound delicious. Can't wait to try it in the upcoming summer day here in Philly.